FruitJuice is a Mac application and online service that helps maximize Apple notebook battery life and runtime. FruitJuice makes it possible to follow Apple’s recommendations for ensuring longer battery life and accurate “time remaining” estimates when running on battery. 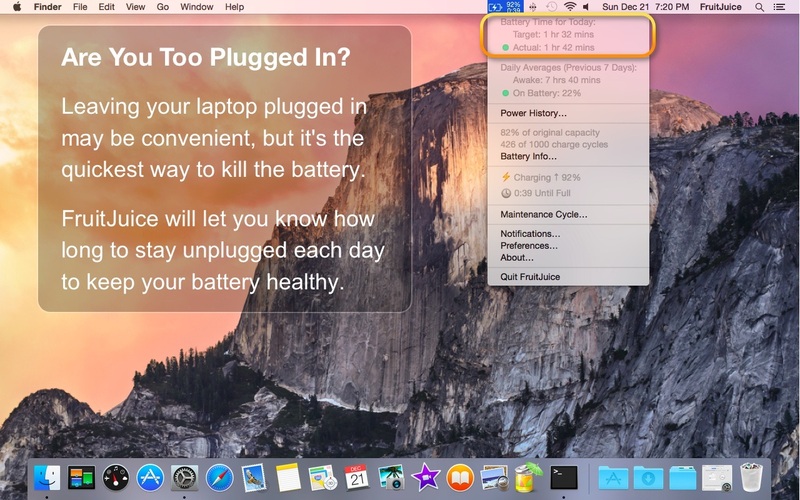 It works by tracking the battery’s condition and usage in real-time and provides a complete picture of the battery’s health in a simple, elegant OS X interface. According to the “Apple Notebooks” webpage: “The built-in battery of your MacBook, MacBook Pro or MacBook Air is designed to deliver up to 1000 full charge and discharge cycles before it reaches 80 percent of its original capacity.” Only with FruitJuice can you can find out the current health of your battery and see whether it is performing up to Apple’s specifications. All the information you need is in one place in the “Battery Information” screen. In addition to the main application, FruitJuice also provides a menu bar application that replaces the built-in battery status menu. At a glance, it shows you much of the same information available in the main FruitJuice application: the current battery information, plugged-in percentage for the last 7, 14, and 30 days, and calibration (or conditioning) status. NEW: Added new "Factory Capacity History" graph which allows you to track the history of the factory capacity percentage and charge cycle changes.